Natural Baltic amber necklace. 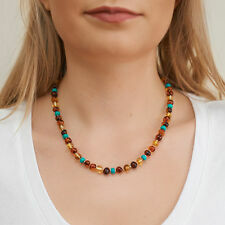 Amber beads in cognac, bronze and citrus colours in combination with turquoise are placed on very resistant steel line, and are separated of each other by sterling silver (.925) separators. An elegant, simple sterling silver clasp is not only easy to use, but is also perfect, stylish supplement of this beautiful jewellery. Perfect combination of the simplicity of amber and modern elegance of turquoise! . Genuine AMBER 925 SOLID STERLING SILVER NECKLACE. The amber beads are interspersed with silver beads. The largest central amber bead is approx 16mm by 5 x 8mm. The bolt clasp is stamped 925 for sterling silver. It is a modernist design and I would guess it dates from the 1960s/70s. The 20" chain has 32 mm long, shaped, solid silver links and a simple, hand made hook fastener. This sturdy, long necklace has a good weight to it (27.6g), is stamped 935, Israel and what looks like XILA on the back. Ideal for Crystal Healing. 925 marked on a mount and on the fastener. IDEAL GIFT. ● Length: 38cm 5cm extension/ 15" 2"extension ● Weight: Approx.2.53g ● Stone: Freshwater Pearl & Cubic Zirconia- Very Close Visual Likeness to Diamond ● Size of the Pendant: 1.8cm/ 0.7" ● Metal: Yellow Gold Plated Sterling Silver ● Please read the size carefully. Sterling silver is a fine metal, the size of a sterling silver jewellery will not be as big as costume ones of similar prices. ● New with Tags OUR SILVER We are a registered trader which ensures the fineness of the silver. Silver items over 7.78 grams are verified and hallmarked. For silver items under 7.78 grams, we also offer a free acid test on our products for silver proofing. You can request an acid test on the silver item before the item gets dispatched. This fun Sterling Silver Union Jack charm necklace by Hiho Silver uses Carnelian, Lapis Lazuli & Pearl stones for a red white and blue finish. Union Jack Size 14 x 8mm. The gemstones really sparkle because they are expertly polished and faceted at the front and the back. Each oval gem is about 1.4 cm long. THIS IS A LARGE SILVER MOUNTED AMBER PENDANT. Ending 30 Apr at 4:14PM BST4d 20hCollection station availableMetal: Sterling SilverStyle: ChainLength: 16 - 17.99"
For sale is a solid sterling silver Opal Gemstone Hamsa Pendant and Chain - see the pics. A good sized Real Opal stone in a beautiful Hamsa pendant with chain - see the pics. Both the Hamsa Pendant and chain are MARKED 925 solid silver. This beautiful necklace has a central large Mystic Rainbow Topaz stone, and is surrounded by White Topaz stones, all set in Sterling Silver. 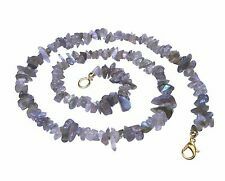 Sterling Silver .925 Amethyst-5.50 tcw Cluster Pendant Fine Necklace-23"